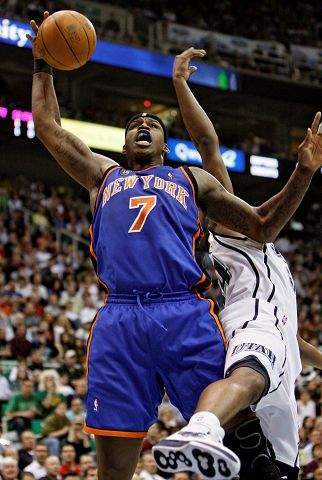 New York Knicks forward Al Harrington (7) pulls down a rebound during a game March 29 in Salt Lake City last season. The free agent power forward is headed to the Denver Nuggets, who are in dire need of frontcourt help with Kenyon Martin, Chris Andersen and Nenê coming off leg injuries. DENVER  The Denver Nuggets got their big man. Now, will they keep their star? Free agent power forward Al Harrington says hes headed to the Nuggets, who are in dire need of frontcourt help with Kenyon Martin, Chris Andersen and Nenê coming off leg injuries. Now it appears the ball is in All-Star Carmelo Anthonys frontcourt. Anthony has said he wanted to see the team bolster its frontcourt, a sentiment shared by the front office, which failed to get back into the draft last month to draft a big man and then was unsuccessful in its pursuits of free agents Jermaine ONeal, who went to Boston, and Udonis Haslem, who stayed in Miami. If Anthony rejects the Nuggets extension, he would be the headliner of the 2011 free agent class a year after LeBron James and Chris Bosh took their talents to South Beach to play with Dwyane Wade and the Heat. At the NBA Finals last month, Anthony said he would like to see the Nuggets add some talent to the roster after their first-round flop in the playoffs a year after reaching the Western Conference finals. Here comes Harrington, a 6-foot-9 forward who averaged 17.7 points and 5.6 rebounds last season. One of his best games was in Denver on Nov. 27, when he scored 41, but Anthony had 50 in the Nuggets 128-125 win. The Mavericks made a strong push for Harrington after acquiring Tyson Chandler, but they couldnt commit the minutes or money the Nuggets could. Harrington would make about $5.8 million next year with the midlevel exception and more than $33 million over the next five years. With players on the mend from offseason knee surgeries, Harrington likely will start the season at power forward with Nenê at center. Andersen also had surgery Wednesday to repair a torn ligament in his left ring finger. He broke the finger March 13 but continued to play with the injury.